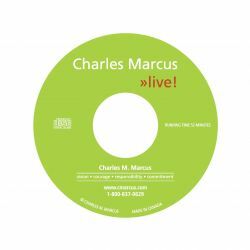 This is the Audio version of the DVD Charles Marcus Live. Take it with you in your car, to your workout or anywhere where listening to Charles’ motivational stories will inspire you. Learn about the universal principles and thought-provoking lessons that Charles has discovered in his personal and professional experiences and his incredible life. His hard won lessons have contributed to his remarkable transformation from a person with a severe stuttering disability, to an award-winning sales professional and successful entrepreneur.